Hope y'all had an amazing weekend. Anywhoo, this is what I wore to church today. Picked this outfit when I woke up this morning, I didnt have strength to go on any ultimate search in my wardrobe. 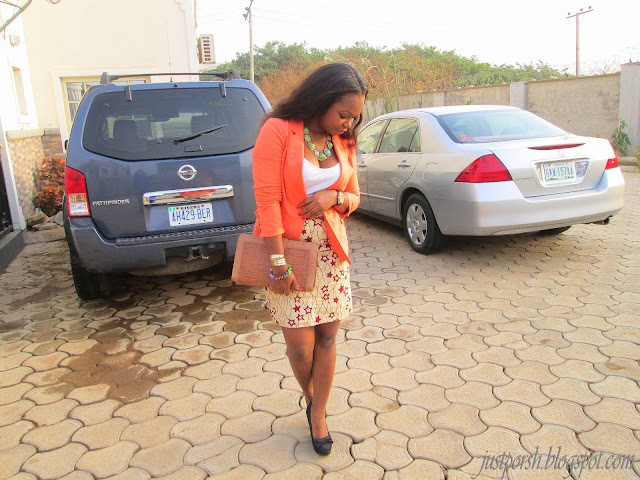 What do u pick when u are at loss on what to wear? "The fear of God is the beginning of wisdom, but fools despise wisdom and instruction"
haha.. abi u'r a star ohhh.. u'r sure u didn't ultimate search :/ cute outfit :) have a great week ahead! Great outfit!! 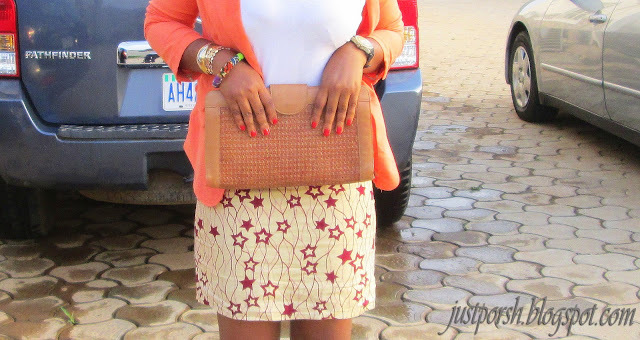 Loving that printed skirt! You look gorgeous in this outfit, I like its colour and how it fits you. And love the necklace. Those colours suit your skin tone perfectly - you look lovely, and I love that purse. 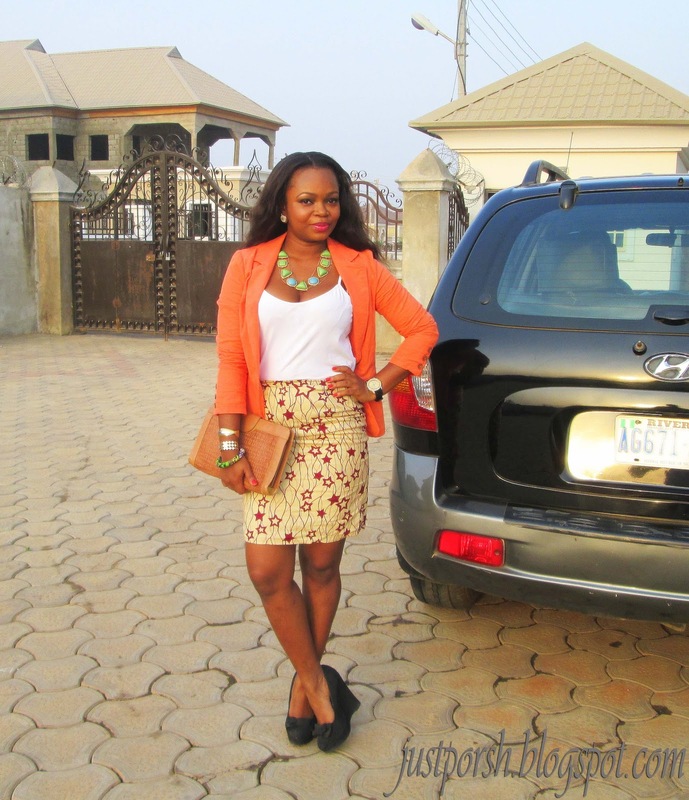 That orange looks fabulous on you hun, love the whole look! Awwwww! Thanks darling! Loving d color orange now! I love this look! The skirt is so adorable! The coral is an amazing color on you!! Send me a mail dear. I love that fabric. I have been trying to get my hands on it ;) Lovely combo! Hi justporsh , love your name. Your blog seems just feminine. Are we out of d scene. No u rnt. I wud definitly have something for d male folk, k.
The outfit is super cute and doesn't look like you just woke up and threw stuff. Super chic. Loving the color of the ankara. I have that same fabric but in super bright colors, I really like the shade of yours. My 'just woke up and threw stuf together' outfit is a light dress. LOL at your mum screaming. So funny! lmao! My mum can be vewy funny sha. Portia ur outfit is lovely and it do suit you well. Love your outfit and the colour of that blazer suits you so well. And yes we can follow each other. 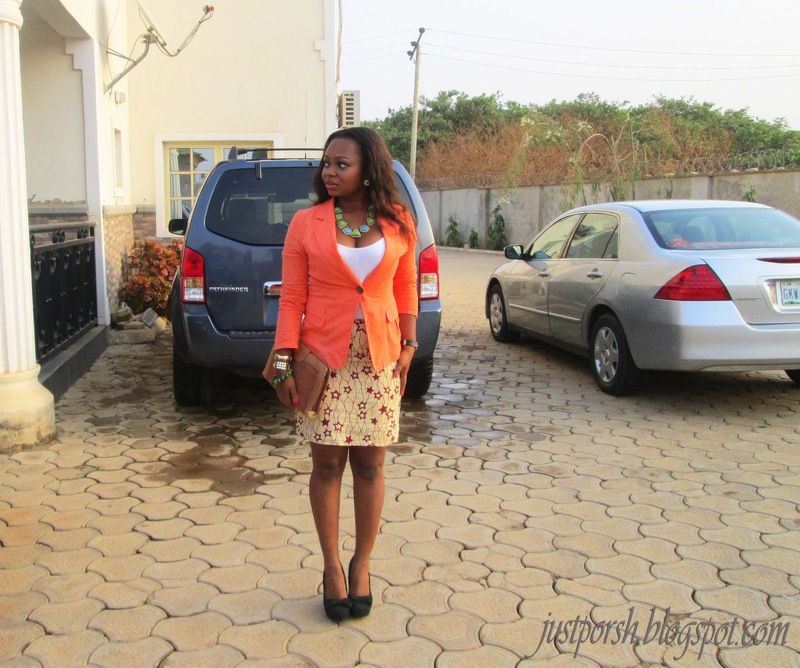 The tangerine colored blazer looks excellent! Very easy on the eye. Great fabric! 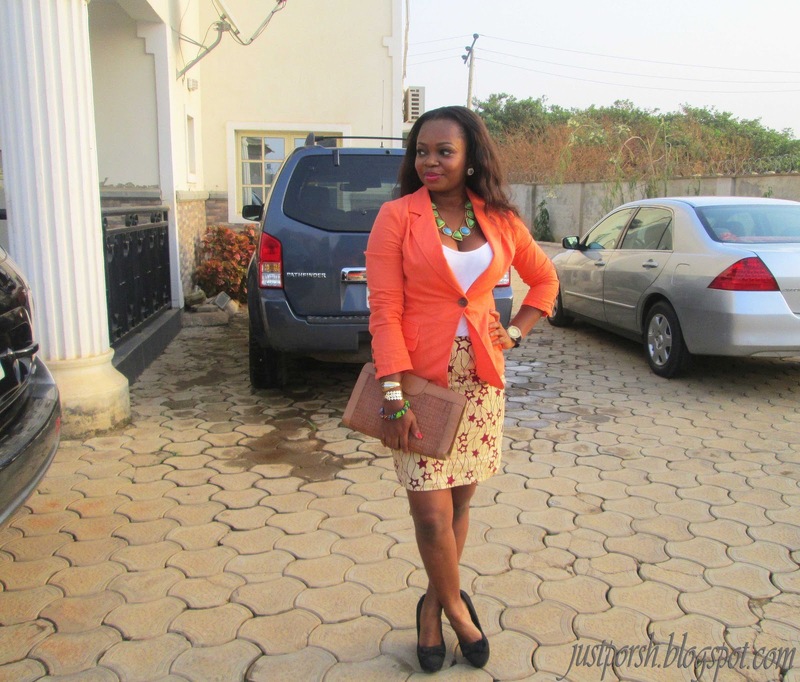 Love your orange blazer with it. The orange looks great on you! Thanx for your nice comment!